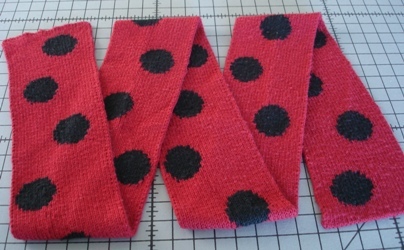 I got a request for a “ladybug” scarf. I knew immediately which yarn I wanted to use. I had been suffering from Debbie Bliss Baby Cashmerino envy and just needed an excuse. I knew it came in black and a perfect red. 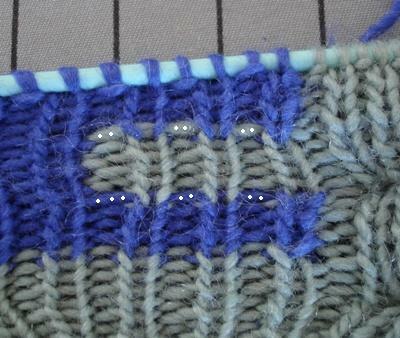 It’s light enough for an all-over k1 p1 ribbing scarf, it will be nice and flat. Since it will be hanging with all the tension in the lengthwise direction, it will always be un-expanded. Wider and shorter would be a great Baby Blanket , lots of great colors of DBBC! 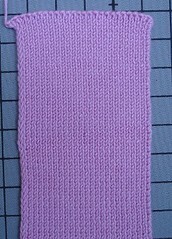 I knit a large swatch in k1 p1 ribbing to get the pattern gauge. I measured the gauge (un-expanded) and made a graph to match the size of the scarf I wanted. 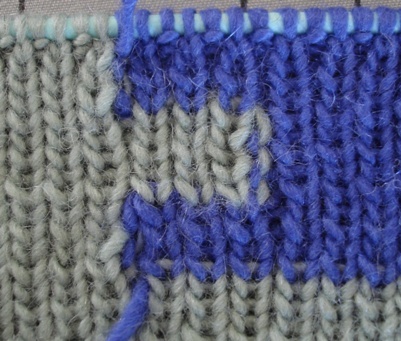 Each square represents two stitches, one knit, one purl. 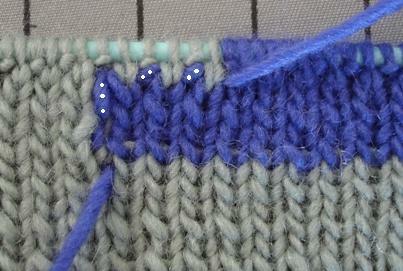 Only the knit stitch will show, the purl stitches will recede and be visible as knit stitches on the other side. 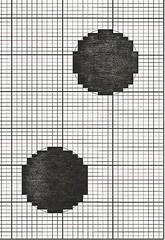 I added circles to represent the spots and then tried different combinations of filled squares to get the best approximation of a circle. 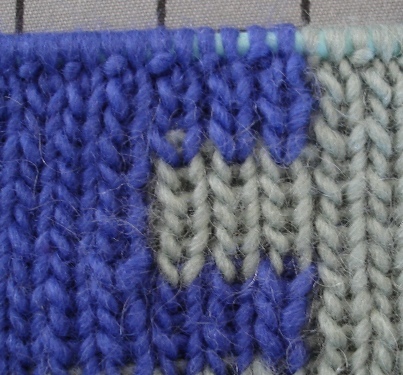 Next, the worst part, okay maybe the second worst part, figuring out how to make a two-sided intarsia scarf that doesn’t look crappy on one side. 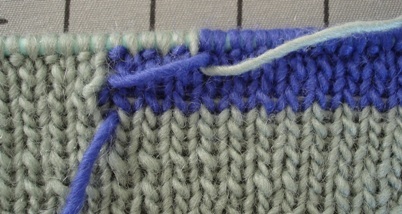 To hide the floats, I lift the float over a (same color) stitch that appears as a purl stitch on the right side (RS) (knit stitch on the wrong side (WS)). The float zig zags between the front and back laying on top of the purl bumps. One more time, going back the other way. 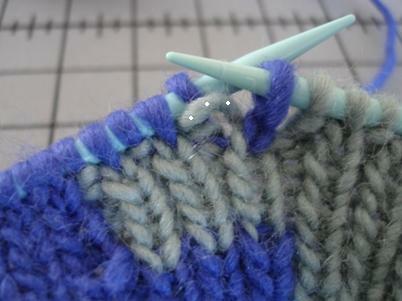 NOTE: Be sure to weave the float over stitches of the same color. 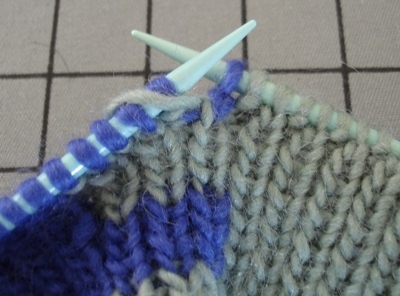 NOTE: Weave in the ends mostly vertically, so they won’t work themselves out when the ribbing is stretched and springs back. Debbie Bliss Baby Cashmerino, it is super soft. Lots of great colors for other spotted scarf combinations or baby blankets. It PILLS though. 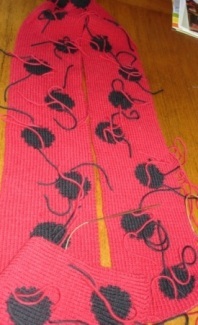 The beginning of the scarf was pilling by the time I finished it. DD is very happy with the scarf, we’ll see how it wears. Entry filed under: Finished!, learning, Yarn. 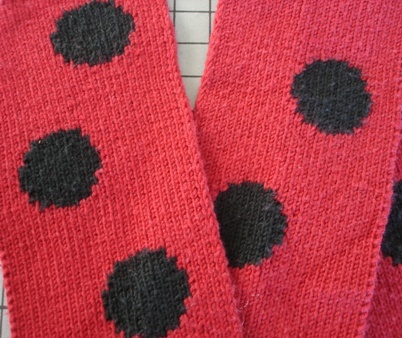 Tags: Baby Cashmerino, Debbie Bliss, float management, ladybug, polka-dots, reversible intarsia, scarf, two-sided intarsia. OMG! You are too clever! I would never have thought of that and would have sonvinced her she really wanted something else. Or would have knit two scarves and sewn then together to be “extra warm”. Yeah, that’s it. 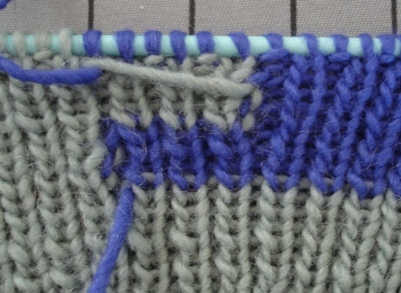 I found this site looing for how to weave in ends when intarsia knitting. Thanks for the tutorial. I have lots of ends but no floats. 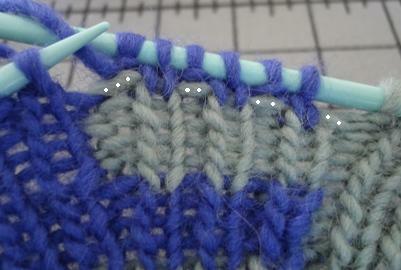 Where do floats come from in intarsia knitting??? I hope you can help. I wonder if this would require more yarn? I would like to try it with the new Nona’s Garden shawl by KnitPicks. THANK YOU! 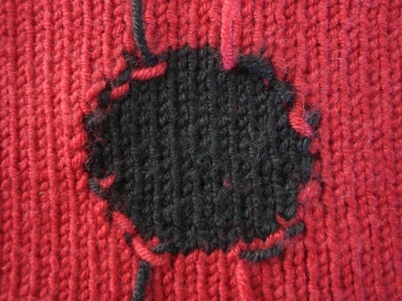 I want to design an intarsia scarf but I don’t want to have to knit the damn thing in the round. This tutorial is awesome! Hi! 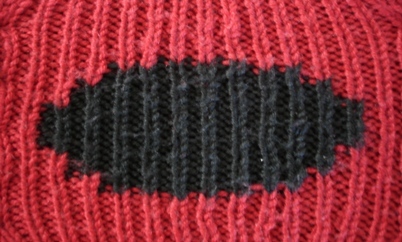 I’m newbie with intarsia and was wondering would your tip about the floats change if I was doing stockinette instead of k1p1-ribbing? 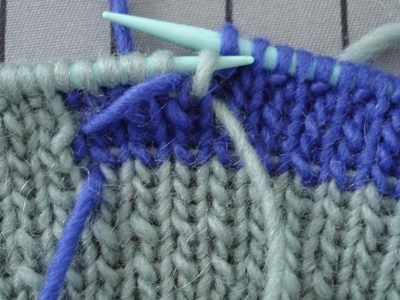 Hi Shan, The method I came up with won’t work with stockinette; it only works with K1P1 ribbing because the floats zigzag between the front and back, laying on top of and appearing to be purl ‘bumps’. 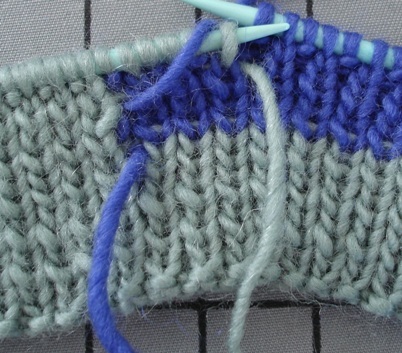 I’m about to knit a scarf for my sister’s cat and was clueless about how to do an intarsia design that looks good on both sides. Thank you so much for this. Your explaination is so clear and easy to follow. Try as I might, I don’t understand how you use this little trick for the circles. Do you use it on every row? Just to give you an idea of my project, I’m knitting a scarf with the English rib stitch and want to knit simple ghosts, pumpkins, and maybe Frankenstein’s Monsters. I don’t want an ‘ugly’ side. Can that be done in my project? I appreciate any advice and pointers. Thanks! Thanks a million for posting this! 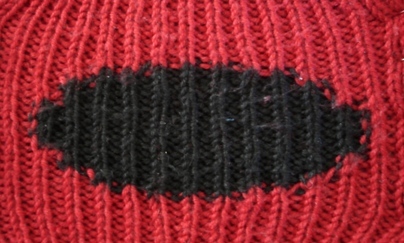 It’s the only reference I find anywhere on using 1×1 ribbing with intarsia. 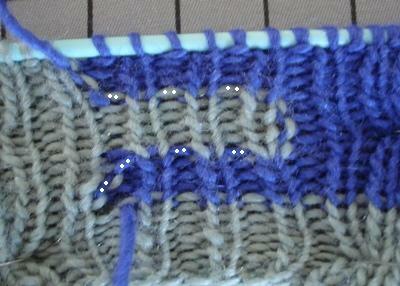 My project isn’t two-sided, so I’m not bothering with the floats, but someday I would love to do a scarf this way!